MUNICH – Fiat S.p.A.'s closure-threatened factory in Sicily could build electric cars under new owners, a newspaper reported. Cimino & Associates Private Equity is talking with an India-based company that builds the G-Wiz and is raising funds for a project to produce electric cars at Fiat's Termini Imerese plant, according to the Financial Times. Simone Cimino, chairman of the Milan investment house, told the newspaper that he has already raised about 50 million euros of funding from investors including the Sicilian regional government and French bank Natixis. He is also in talks with Bangalore-based electric car maker Reva. Reva, whose cars are branded G-Wiz in the UK, unveiled its three-door NXR lithium-ion powered electric car at the 2009 Frankfurt auto show. The hatchback sells in Europe for about 15,000 euros excluding batteries. 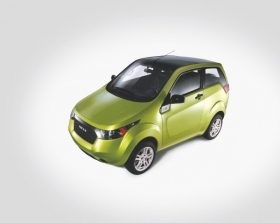 It has a top speed of 104kph (65mph) with a range of 160kms (100 miles) per charge. Keith Johnston, president of Reva's European operations, said the Sicily proposal would allow the company to produce a next generation line of cars to succeed the models that can be seen on the streets of Bangalore and London. Taking over and modernizing part of the Termini plant would enable it to cut production times as well as use a Fiat-trained workforce producing an electric car that would sell for about 16,000 euros to 17,000 euros, he told the Financial Times. "Between 1 and 1.5 per cent of new car volume will be purely electric by 2015," the newspaper quoted Johnston as saying. Cimino said he needed a minimum investment of 65 million euros to start making electric cars at Termini Imerese. Investments could eventually rise to 900 million euros. The venture would need to make 30,000 cars a year to break even. It would cut production times for cars by modernizing the factory, and would build electric cars selling for 16,000 to 17,000 euros using Termini's Fiat-trained workforce. Italy's government has said that it has received 8 to 9 proposals for Termini, which has about 1,400 workers and which Fiat plans to close in 2011. Last June, Fiat CEO Sergio Marchionne told Italian government officials and union representatives that the company will close Termini Imerese because it is too expensive to run. The factory builds the Lancia Ypsilon small car. Fiat plans to produce Ypsilon replacement, due in 2011, at its Tychy plant in Poland. Fiat said production in Termini Imerese loses money because logistic costs to deliver parts to the island of Sicily add about 1,000 euros per unit. Fiat said it is willing to hand over the plant for free to any serious business activity that would preserve jobs.